Entrepreneur Daniel Ally recently wrote an article for Business Insider about how to improve your networking skills and tactics by sharing personal stories and his best areas of networking success. Daniel recalls, "As I was giving a speech in Washington, D.C., a well-dressed man approached me to ask a question. After our interesting discussion, he reached deeply into his pockets and pulled out a stack of cards, spilling them by the dozens as he searched to find his own. 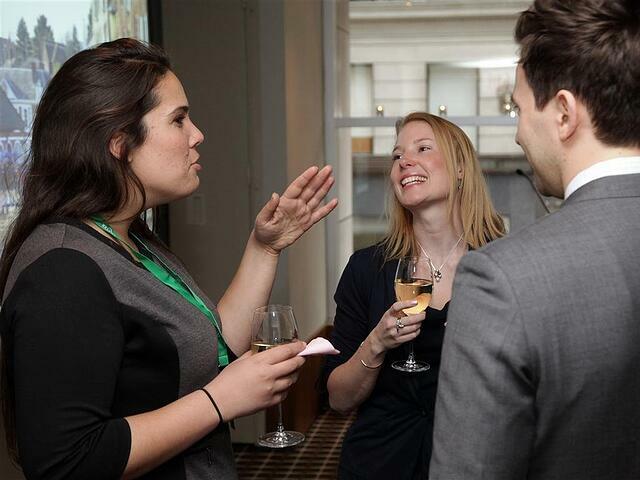 The number one tip in networking is to avoid thinking of it like most people do. After all, why fit in when you can stand out? If you want to stand out, don't go to the networking event with the wrong intentions. If you're there to flirt, eat, or get a job, you're going to fail. You need to have the right motives, which should be to help people and make a positive impact. We all know the predominant question for most people is, "What's in it for me?" If you network like with that question in mind, you're missing the point. The key question that I ask myself to expand my network is, "How do I add more value to more people in a shorter amount of time?" This question made me a millionaire. After all, if you impact twice as many people, you'll earn twice as much." When I first wrote my book, I didn't realize that it was a business card. In fact, I started to give my book out freely and then began to use my business card as a bookmark. Writing a book is easy and will impress most of the people you meet. My articles have reached millions of people. Most of these people who read them could never help me, but that doesn't matter. All that really matters is that people are reading my work. Benjamin Franklin once said, "Writing is the beginning of all wealth." It's true. My inbox is filled with people who have requests of all different kinds and many of them are useful. By writing articles, you have the ability to attract thousands or millions to yourself, instead of chasing them down. Plus, it's easier to have people reach out to you, especially if you gave them what they wanted. If you're in business, you have the ability to sell your products and services to a wide variety of people. What's more amazing is that there are thousands of meetings going on right now and many of them don't have speakers. If you gave a few speeches per month, your chances of success go up substantially. Zig Ziglar once said, "If you help enough people get what they want, you will get what you want." One day, a realtor called me and found out that I was interested in a house that she did not list. She took the liberty to connect me with her competitor, which is something most realtors would never consider doing. Later on, I found out the house her competitor showed me wasn't quite for me. Because of her kind referral, I decided to reach out to her and deal with her again. Eventually, I bought the house and she received a nice commission due to her excellent service. All she did was connect people No wonder she was the No. 1 realtor in her city. It is futile to meet people and not follow up with them. In fact, you might want to go the extra mile by sending them a personal thank-you note. I sometimes send my books to people and you wouldn't believe the kind of response that I get back. We are creatures who love to cooperate with each other. Often, people forget that they said certain things at a particular event, and it's your duty to remind them. If you can follow up in a tactful and diplomatic way, you'll get to reach the echelons of success. The fortune is in the follow-up. Once people find out that you're a donor, you'll make a lot of friends. Everyone likes people who give money. You don't have to go around waving a check for your contribution, but you do want people to acknowledge that you are a giver. The secret of living is giving. If you're serious about increasing your network, you should consider taking up new hobbies. For instance, there are different personalities and temperaments in poker and basketball than there are in golfing and yachting. Since we all have hobbies, you would be better off gravitating toward ones that help you improve your overall "game." If you're going to network, do it right. Skip the name tags and small talk and get straight to business. Make sure that you're reaching out to people and realize that people are looking for you just as much as you're looking for them. As Gandhi said, be the change you wish to see in the world. Read the original article on Business Insider. Copyright 2015.